Bike 2 office. - GGI-Group size: 4000+ Professionals, Increasing on day to day basis, Come & join us 2 serve Mother Nature. Sharing experience puts anyone in the celebrity of happiness and perfection towards enhancing the objectives. Then, what is our objective? 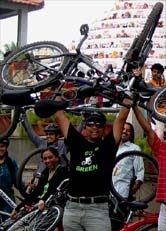 Cycling - “Go Green” !! In this back drop, I thought it fit to share the following, so that I am sure, you will certainly lay concrete towards achieving the common goal set for the benefit of the society at large. Building a team for this cause, you will kindly agree with me is very difficult, though not impossible. Nothing is impossible in this world provided the cause is unequivocally made known when the aspiration comes to the mind. Then, the Success is sure. Having frustrated due to the colossal traffic, thought of venturing into cycling. During the last seven months to till day, I have urbanized a team consisted of 14 members of our company in which, twelve guys and two girls are in the venture. All of us are from the same Corporate building. I have marked Tuesday and Fridays to be our Go Green Day and we all ensure to wear our Go Green Attire as shown in our home page. 3. Eases traffic and causes less congestion on the road. 4. Keeps you fit and trim. Very good for the heart and a good exercise. 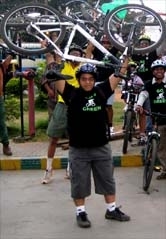 All our team members ensure to carry a set of changing cloths to address sweating problems more over we do try to change with 1 more set of Go Green T-Shirt and work, so that people around us r aware about our cycling activity.. below or few photographs of my team mates from my work place. Enclosed below is a pre-recorded video telecasted on Local kannada Kasturi channel on 18th April 2009 @ 10:00pm, They have covered our bike 2 work concept and relayed. 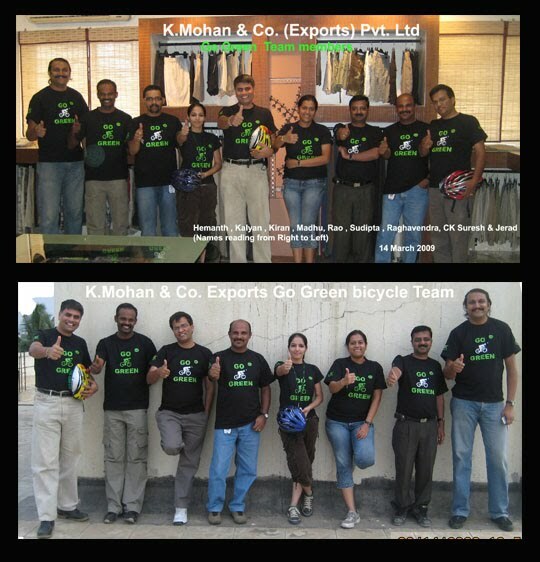 KME's GGI's working with their Go Green Ataire @ Work Place. 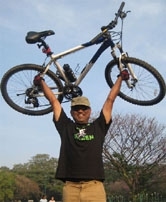 I know u need to listen to 101 stories from u’r close friends and colleagues for not getting on to the cycles rather, I would advise u to go through our no-more-excuses link http://www.gogreengocycling.org/resource-section/no-more-excuses and try to follow these for successfully motivating them however if u need any kind of help please do shoot a mail to Rao@GoGreenGoCycling.org .